RARE FIND - BRAND NEW EXTRA LRG BRAND NEW MODERN/STYLISH SEMI-DETACHED RANCH HOMES IN A DESIRABLE LASALLE LOCATION. GREAT CURB APPEAL, FULL STONE AND BRICK. 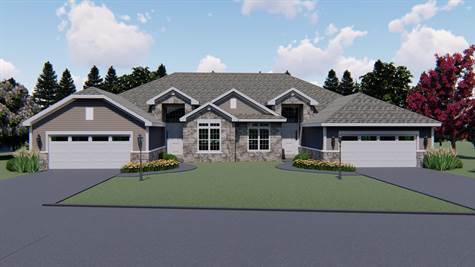 LRG INVITING FOYER LEADS YOU TO THE OPEN CONCEPT MAIN LVL W/SOARING CEILINGS. LRG GOURMET KITCHEN W/STYLISH CABINETS & GRANITE COUNTERS & BACK SPLASH. LAVISH ENSUITE BATH & W-IN CLST ATTACHED TO MASTER. FULL HARDWOOD AND TILE ON MAIN LEVEL, 2 BEDS AND 2 FULL BATHS, MAIN FLOOR LAUNDRY. MASSIVE COVERED PORCH OFF PATIO DOORS. BSMT MAY BE FINISHED AT ADDITIONAL COSTS. WALKING DISTANCE TO ALL AMENITIES, RIGHT BEHIND THE REXALL IN THE HEART OF LASALLE!! HIGH QUALITY FINISHES THRU-OUT ARE A STANDARD W/PARK HILL BUILT CUSTOM HOMES! COME DISCOVER THE DIFFERENCE TODAY FOR YOURSELF!! PEACE OF MIND WITH 7 YEARS NEW HOME TARION WARRANTY! !